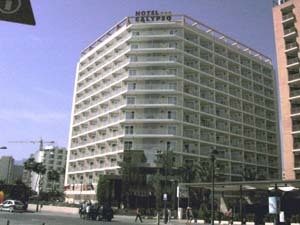 The Hotel Calypso is situated a few minutes walk from Benidorm's Levante Beach.It is ideally located in the centre of the night life of Levante and Rincon de Loix areas. 'The Square' is about 5 minutes walk, this is great, as it allows you to be close enough to all the action, without being right on top of the clubs and bars! Hotel Servigroup Calypso has a large sun terrace with swimming pool for both adults and children, sunbeds and parasols. Bar-terrace and garden area are also provided. Relax around the pool with your partner or all the family! "You Do Get What You Pay For"
The Hotel Calypso is only a three star hotel. It was very basic. You will notice that the little extras that you get at other hotels is missing, but you do get what you pay for in this life! That said, for the seven days of our trip, our room was clean and fresh towels were provided each day. The hotel had a general feel of cleanliness. The location was great for travelling around by foot, and the transport links to Port Aventura where nearby and easy. This hotel suited our needs for a budget summer holiday with a child.